Sci­en­tists have de­vised a new way to see how pro­teins, ti­ny ma­chines nat­u­rally built in­side our bod­ies, as­sem­ble. The re­search could help fight dis­eases such as Alzheimer’s and Parkin­son’s—caused by er­rors in as­sem­bly—or en­a­ble bio­engi­neers to make new mo­lec­u­lar ma­chines, the re­search­ers say. The study was pub­lished June 10 in the jour­nal Na­ture Struc­tur­al and Mo­lec­u­lar Bi­ol­o­gy. “All crea­tures, from bac­te­ria to hu­mans, mon­i­tor and trans­form their en­vi­ron­ments us­ing small pro­tein nano­ma­chines made of thou­sands of atoms,” ex­plained the sen­ior au­thor of the stu­dy, Ste­phen Mich­nick of the Uni­vers­ity of Mont­real de­part­ment of bio­chem­is­try. “For ex­am­ple, in our si­nus­es, there are com­plex re­cep­tor pro­teins that are ac­ti­vat­ed in the pres­ence of dif­fer­ent odor molecules. Some of those scents warn us of dan­ger; oth­ers tell us that food is near­by.” Pro­teins are made of long chains of ami­no acids, which have evolved over mil­lions of years to self-as­sem­ble ex­tremely rapid­ly—often in thou­sandths of a sec­ond or less—in­to a work­ing “nano­ma­chine,” or mo­lec­u­lar-scale ma­chine. 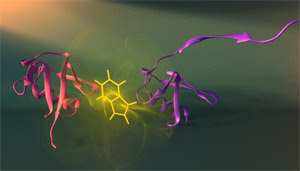 “One of the main chal­lenges for bio­chemists is to un­der­stand how these lin­ear chains as­sem­ble in­to their cor­rect struc­ture giv­en an as­tro­nom­ic­ally large num­ber of oth­er pos­si­ble forms,” Mich­nick said. “To un­der­stand how a pro­tein goes from a lin­ear chain to a un­ique as­sem­bled struc­ture, we need to cap­ture snap­shots of its shape at each stage of as­sem­bly,” said Alex­is Vallée-Bélisle, a co-au­thor of the stu­dy. “The prob­lem is that each step ex­ists for a fleet­ingly short time and no avail­a­ble tech­nique en­a­bles us to ob­tain pre­cise struc­tur­al in­forma­t­ion on these states with­in such a small time frame. We de­vel­oped a strat­e­gy to mon­i­tor pro­tein as­sembly by in­te­grat­ing flu­o­res­cent probes through­out the lin­ear pro­tein chain so that we could de­tect the struc­ture of each stage of pro­tein as­sembly, step by step to its fi­nal struc­ture.” The as­sembly pro­cess, which be­gins us­ing in­struc­tions in our DNA, is it­self not the end of its jour­ney. A pro­tein can change, through chem­i­cal modifica­t­ions or with age, to take on dif­fer­ent forms and func­tions. “Under­standing how a pro­tein goes from be­ing one thing to be­com­ing anoth­er is the first step to­wards un­der­standing and de­sign­ing pro­tein nanoma­chines for biotech­nolo­gies such as med­i­cal and en­vi­ron­men­tal di­ag­nos­tic sen­sors, drug syn­the­sis or de­liv­ery,” Vallée-Bélisle said.